Hypericum is a large genus of flowering shrubs, ground covers and annuals with a worldwide distribution. Known for their ornamental flowers and foliage, most species of Hypericum are frost-resistant plants that can be grown in landscapes as border plants or ground covers. Most species of Hypericum can be grown in shaded or semi-shaded areas of the garden where they bloom profusely in spring or summer. The flowers are bright yellow or golden. A number of hybrids have been produced for their horticultural use. Among many useful flowering shrubs and ground covers, my personal favorite is Hypericum calycinum which is a vigorous growing plant. 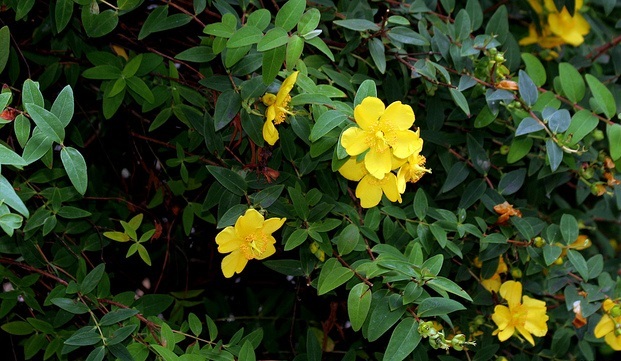 Usually grown as ground cover or small shrub, this lovely bloomer produces bright yellow flowers in summer. The flowers are chactrized by a mass of showy stamens that make this flower look quite unusual. H. calycinum prefers bright sunlight and moderate watering. The plant is commonly known as Rose of Sharon. Other popular species of Hypericum include: H. perforatum (it is a popular homeopathic remedy for relieving pain and depression), H. uralum, H. pulchrum, Hypericum olympicum and Hypericum hidcote (St. John’s wort).